4nec2 seems to be one of the best kept secrets in amateur radio. It provides rich and deep antenna modeling and optimization functionality above and beyond what’s available in other popular programs. …and it’s free, which seems to be the primary criterion for many of my fellow hams. When I first started using it a couple of years ago, I found only sparse documentation. As someone who was completely new to antenna modeling and new to 4nec2, I can tell you it was a huge challenge to learn both at once. I was pretty confused, but it turns out that most of my confusion was caused by my unfamiliarity with the concepts of terminology of nec itself. These days, a simple Web search for “nec” and “4nec2” will produce many results that can help a newbie along the path. 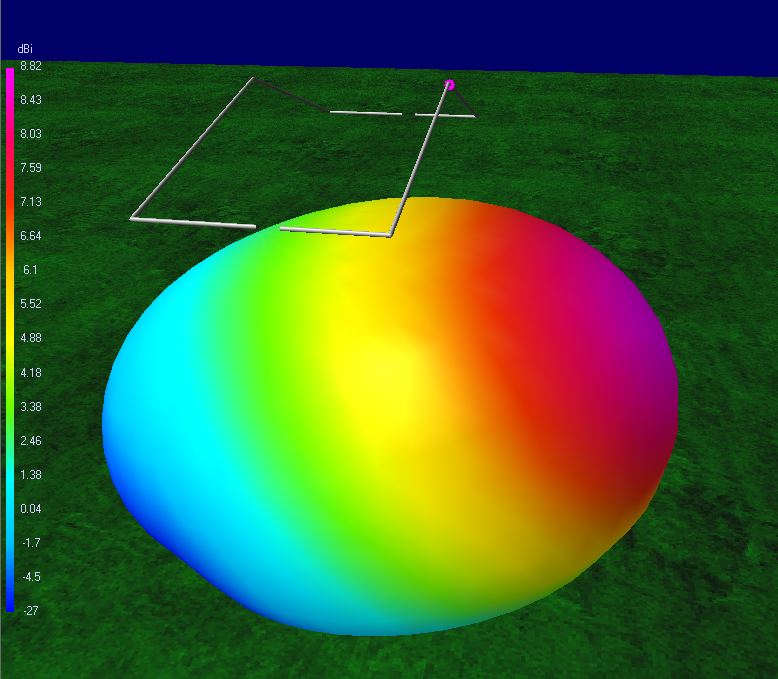 One thing that took me a long time to discover and figure out was how to model insulated wire in 4nec2. Surprisingly, even though many of us are building antennas using insulated wire, the topic of how to accurately model those antennas in nec2-based programs seems to be almost entirely missing from the Web. I think I saw a Cebik article in which he mentioned an “LD7” card and a saw a few other mentions of this mysterious thing, but that was it. A walk through the latest nec2 documentation didn’t help me very much, either. In the nec editor in 4nec2, go to the “Source/Load” tab. Make sure that “Show loads” is checked. Under “Load(s)” set the Type to “Wire-coat”. In “Diel-C” (dielectric constant) choose the insulation material from the list. This one is non-obvious: In “Radius” you need to set the TOTAL radius of the wire, i.e. conductor + insulation. And remember that radius = diameter / 2. That’s it! Now you can edit your geometry to your heart’s content and all of your wires will inherit this insulation. “Okay,” you say, “but what if my antenna is built with multiple wire types?” When all the wires in your model don’t share the same properties you’ll have to specify the properties for each wire independently. This means you’ll end up with a “Wire-coat” line for every wire in your model and you’ll have to the “Tag” of each to match their respective wires. You can still set “First” and “Last” to zero if the insulation covers the whole wire. While we’re in the “Source/Load” tab, let’s look at a couple of other important things. First, you should make sure to specify the wire conductor material here. To do that, you simply click in a blank row, set the Type to “Wire-conductor”, set Tag, First and Last appropriately (and just make them all 0’s if you’re using the same conductor material throughout the model), and then choose the appropriate material (e.g. “Copper”) in the drop-down list under “Cond(S)” (which I think means conductivity (Siemens)). One more tricky thing about modeling wire is that, in the geometry, you need to specify the radius OF THE CONDUCTOR and NOT the whole wire. So, again looking at TheWireman 532, we’d use 0.000565 or 5.65e-4 as the wire radius in the geometry of the model. That’s my quick summary of how to model wire with insulation in 4nec2. I hope it helps. It made a huge difference for me. I used to model antennas and then always get frustrated when they were too long and required iterative tuning. The first time I built an antenna (a 40m moxon) that was modeled with the appropriate conductor and insulation, it was perfect the first time — no tuning required. Pretty cool, eh?